NDO - Lychee growers in the two lychee farming hubs of Vietnam, namely Bac Giang and Hai Duong provinces, are busy with harvesting this season's first crop of lychees, while preparing for picking the lychees of the fast-approaching main crop scheduled for the next five days. By June 5, the lychee growing areas in the northern province of Bac Giang are entering the end of the early maturing fruit crop and are in preparation for harvesting the main crop. The province is expected to harvest 150,000 - 180,000 tonnes of lychees in this season, the highest volume of the past few years, thanks to the favourable climate and the acceleration of the application of technology in farming in accordance with VietGAP and GlobalGAP standards. In particular, the quality and shape of lychees are considered as the best in the past 10 years. 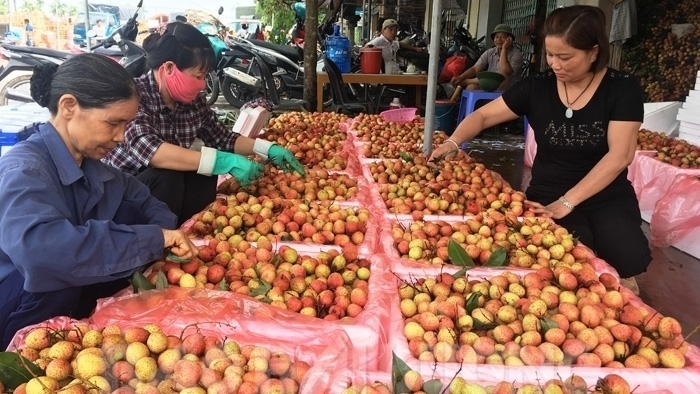 The entire province of Bac Giang is estimated to sell approximately 9,000 tonnes of lychees by June 3, with a total value of VND170 billion (US$7.48 million). Meanwhile, in the lychee farming hub of Hai Duong, Thanh Ha lychees are labelled with QR code stamps and all growing areas that meet the VietGAP and GlobalGAP standards will also be labelled with QR codes in order to trace the origins of the fruit. QR code labels are an essential requirement for Vietnamese lychees if they are to be exported to the Chinese market through the Guangxi border in 2018. According to the Hai Duong provincial Trade Promotion Centre, lychees tagged with QR codes are valued by consumers, particularly those in large cities and they are also sold at least 10% higher than those without a QR code. The good news for lychee growers is that the Red Dragon Company successfully shipped 1.2 tonnes of early maturing lychees to Australia on March 28, which was the first batch of Hai Duong lychees to be exported to Australia. The company also plans to export more to Australia in addition to the EU and the Middle East.